We are pleased to announce a new Reverse DNS Service for our Virtual Server platform. You can now manage your own Reverse DNS entries right from the VPS control panel. 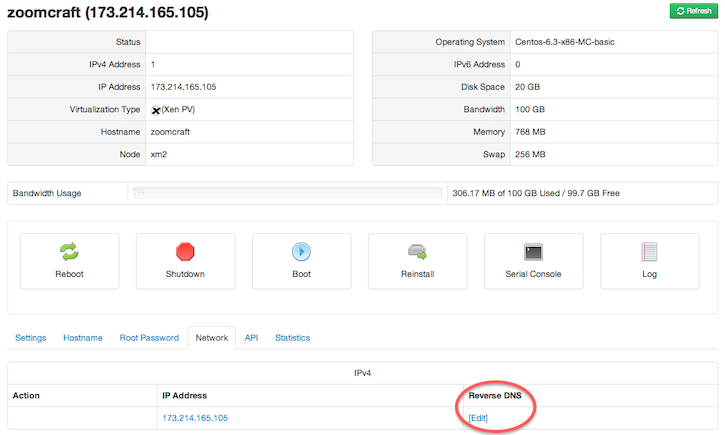 If you would like to setup Reverse DNS for your VPS you must have a proper A record in your forward DNS for the host. You can test this by running "nslookup yourHostName". As long as that returns your IP you are all set. If you don't have DNS setup we can provide you an A record in the zoomcloud.me domain for your VPS. if you need assistance or would like an A record setup, please contact support. Once your A record is setup in DNS you can setup rDNS. Simply logon to the control panel, and under your virtual server select the networking tab. From there click on "edit" next to the IP you want to change. You will be able to enter a rDNS entry for each IP.